Tonight marks the beginning of Hanukkah, and for eight nights, Jews will be celebrating by lighting menorahs of all shapes and sizes in their homes, as well as in public spaces throughout New York. 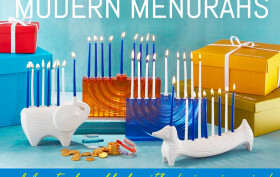 While Hanukkah might not traditionally be thought of as a design-oriented holiday, in recent years menorahs have become more and more creative and diverse. From contemporary interpretations to dinosaur versions to express your inner paleontologist, there is a menorah out there for everyone. We put together a list of some of our favorites that you can buy, in addition to three must-view menorahs in New York City.